Girl Scouts. Cookies. The two have become synonymous, but there is much more to being a Girl Scout than selling cookies. As it turns out, libraries and librarians are often right there helping the troops during their non-cookie-selling time. Juliette Gordon Low organized the first troop in Savannah, Georgia, in 1912, and since then this organization has grown to include over 59 million American women and 10 million international members spread over 145 countries (source). Chances are that many of you reading this blog post are counted among that number. 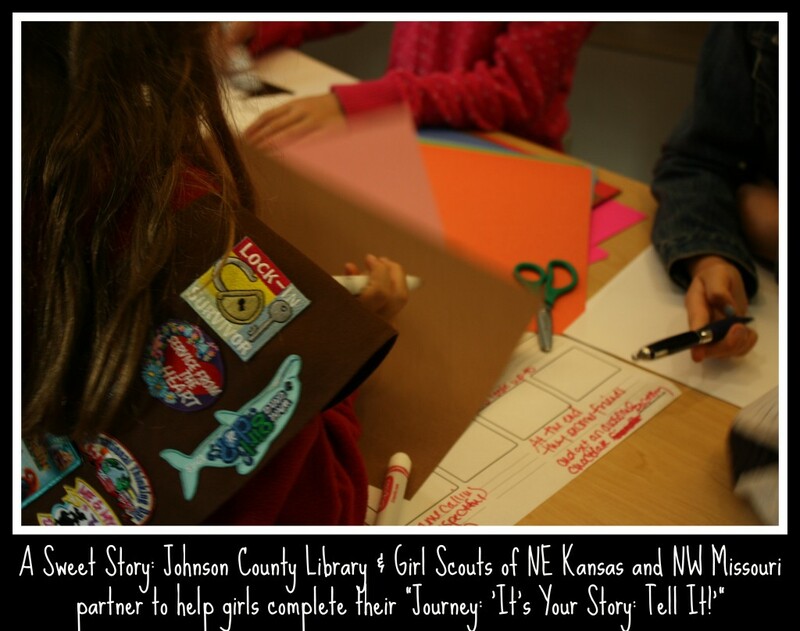 Just last month, JCL librarians, Megan Bennen and Kelly Sime presented this program at the Kansas Library Association Conference and their sessions handouts provide a lot of information on how other libraries could implement a similar collaboration with local Girl Scouts. 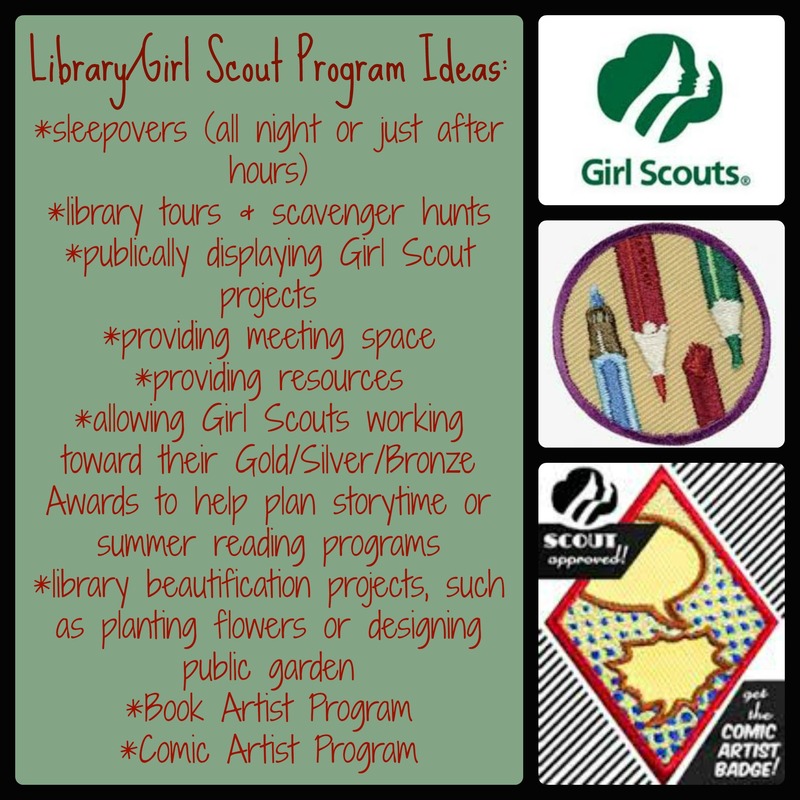 With 2.3 million active girl members and 890,000 adult members serving mostly as volunteers (source), chances are there is an active Girl Scout troop in your community and they would love to work with their public libraries (search for a local council here). 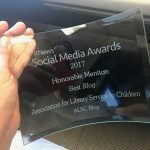 The most important piece of information that I gathered from those librarians that have worked with their local girl scouts is to make sure that there are no communication glitches along the way. The librarians that did experience a few obstacles along the way mentioned that they were usually because of travel accommodations (getting the girls to the library), timing (try to avoid school holidays, such as Fall and Spring breaks), publicity (whose responsibility is it to publicize the event), and budgets (who is going to purchase the supplies, including the badges). Youth Serices Librarians, Karen Lucas from Madison Public Library-Sequoya Branch in Madison, WI, and Deidre Winterhalter, from Hinsdale Public Library in Hindsale, IL, both encountered the transportation problem when working with their local Girl Scouts. Ms. Lucas helped her local troop earn their Reading Badge by asking them to write a brief paragraph about their favorite books and then she used this information to compile a bibliography for 1st and 2nd graders. Ms. Winterhalter also worked with a local troop that could not travel to to the library by having them create a banner to promote the library’s summer reading program. This banner, with their names and troop number proudly displayed, satisfied not only their badge requirements, but also fulfilled a service the library needed. Here’s a fun idea from Abbe Klebeanoff, Head of Public Services for Lansdowne Public Library in Lansdowne, Pennsylvania, that might help brighten your library this winter! QOTD: Have you worked with your local Girl Scout Council? What did your library do and what did you think was most successful about the program? Lori Coffey Hancock is a school librarian for The Lexington School, an independent private school in Lexington, Kentucky. Her involvement with Girl Scouts began when her daughter joined the Girl Scouts as a Daisy in 2009. 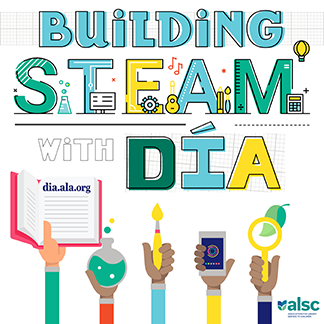 She is currently the Awards chair for the Kentucky Association of School Librarians and serving as co-chair for ALSC Liaison to National Organizations Committee. You can reach Lori on Twitter (@onceuponarun_lh).